A fourth quarter goal from Chris Bocklet via Steele Stanwick proved to be the difference as the No. 8 Virginia Cavaliers (12-3) outlasted the No. 12 Princeton Tigers (11-5) on Sunday afternoon during the NCAA First Round, 6-5, inside Klöckner Stadium. 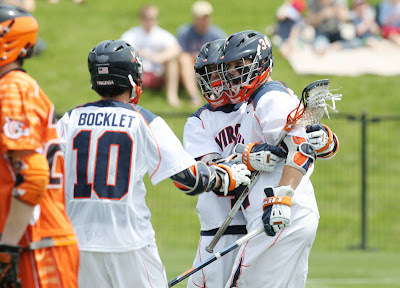 The six goals by UVa is the lowest number of scores for the Cavaliers in an NCAA win and the 11 total goals between the two teams tied for the fifth-fewest ever in an NCAA Tournament game, four other games are tied for first with 10 total goals. Six other NCAA Tournament games have featured 11 total goals, most recent the Syracuse vs. Maryland quarterfinal last season. UVa advances to the NCAA quarterfinal round next Sunday in Philadelphia, playing the winner of tonight's Notre Dame vs. Yale first round game. UVa's NCAA quarterfinal contest will be played at PPL Park and faceoff is TBA. The game will be televised live on ESPNU in HD. Senior Joe Cummings scored with six seconds left in the fourth to send the Maryland men's lacrosse team to the NCAA tournament quarterfinals with a 10-9 victory at No. 7 seed Lehigh Sunday night in front of 2,278 at Banko Field at Ulrich Sports Complex. The Terps (10-5) advance to the quarterfinals and will play No. 2 seed Johns Hopkins game on Sat., May 19 at noon at Navy-Marine Corps Memorial Stadium in Annapolis. The Mountain Hawks finish their season with a 14-3 record.